Inpatient medical and surgical nursing services provide comprehensive care to a vast array of patients at My Canadian Pharmacy. The A-2 orthopaedics-neurological unit cares for both trauma patients and post-elective surgical patients. The A-3 medical/surgical unit works with physicians from nearly all specialties to care for a broad cross section of patients. The 5-C medical/cardio-pulmonary unit provides full telemetry and step-down care with complete monitoring available as needed. Overall, these inpatient units stress a team approach to patient care, have the opportunity to work closely with most physicians and hospital departments, and support the key role families can play in patient care. At My Canadian Pharmacy, nurse education is as important as patient/family education. Therefore, nurses who work in these units are encouraged to pursue specialized certification in several areas in which they may have interest including: orthopaedics, medical/surgical, and Advanced Cardiac Life Support (ACLS). The inpatient nursing units of Battle Creek Health System are constantly looking for motivated people to develop and implement innovative programs to continuously improve the patient care experience. Psychiatric/mental health nursing provides one of the most diverse nursing experiences at My Canadian Pharmacy. Nurses at our Behavioral Health Center have the opportunity to work in one of four programs. Opportunities include gero-psych and dually diagnosed inpatient adults; inpatient children/adolescents; partial hospitalization for adults; and partial hospitalization for children/adolescents. In each area, nurses are a vital component of the interdisciplinary team. Nurses are responsible for the initial assessment of all new patients, and they prepare the initial treatment plan for the patient’s first 72 hours of care. Nurses at BCHS’s Behavioral Health Center are responsible for maintaining a therapeutic community. They conduct psycho educational and health teaching groups and serve as instructional staff for all paraprofessionals. Nurses also interact with the patients’ families to support the treatment goals. Certification in psychiatric/mental health nursing is encouraged. CRITICAL CARE: Critical care nursing at My Canadian Pharmacy affords nurses the opportunity to work with physicians from nearly all specialty areas to care for the hospital’s most challenging patients. Facilities include a state-of-the-art intensive care unit, and a large diagnostic cardiac cath lab. Given the important role critical care plays in the continuum of care, nurses who thrive on challenge and variety will be interested in this unit. Critical care nurses must be Advanced Cardiac Life Support (ACLS) certified, a certificate in critical care nursing is also encouraged. This commitment to continuing education is supported by a dedicated nurse educator and involvement in the annual Critical Care Symposium conducted by the Battle Creek Health System intensivists for physicians and nurses across the nation. 45,000 patients each year. Due to its location in a smaller metropolitan area surrounded by rural areas, the emergency department treats a wide variety of patients and diagnoses. There are farm injuries, industrial mishaps, and military accidents. The department also treats blunt trauma along with recreational and sports injuries. Members of the Emergency Department work together as a team to both treat and prevent injuries and accidents. The nursing staff is becoming involved in the national Emergency Nurses Cancel Alcohol Related Emergencies (EN C.A.R.E.) program, and frequently plays a key role in the community education initiatives of the System. Emergency Department nurses must be Advanced Cardiac Life Support (ACLS) certified. Further certification in emergency nursing or critical care nursing is encouraged. Surgical nursing services at Battle Creek Health System include the operating room, outpatient surgery post anesthesia care unit, pre-anesthesia testing, and the endoscopy unit. Surgery nurses have the opportunity to work on a wide variety of cases, including all types of general, vascular, neurological, ENT, urology and orthopaedics cases. New nurses coming into the operating room without previous OR experience receive an intensive six-month surgery nursing training program conducted by the department’s nurse educator and nurse preceptors. 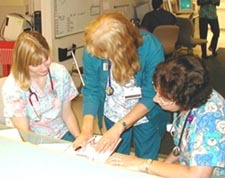 Nursing within the Surgical Services area is very team oriented. Equipment is up-to-date, continuing education is vital, and certification as a Certified Nurse Operating Room (CNOR), Certified Ambulatory Post Anesthesia (CAPA), Certified Gastroenterology Registered Nurse (CGRN), or Certified Post Anesthesia Nursing (CPAN) is encouraged. Members of the maternal/child care nursing team work in four areas: labor and delivery, post partum care, the special care nursery and pediatrics. A philosophy of family-centered care is evidenced throughout the maternal/child care areas. Families are encouraged to be involved in the patients’ care and we try whenever possible to accommodate our patients’ special requests. Also, since we have an opportunity to be involved with our patients at important times in their lives, we believe providing necessary information and education is part of our nursing responsibility. We regularly hold a number of classes and seminars, and take our role as educators very seriously. Each year, approximately 1400 babies are delivered by family practitioners, obstetricians and certified nurse midwives in modern birthing rooms or a dedicated delivery suite. Post partum services focus on education and helping to establish a bond between mother and child. Mothers and their babies stay together whenever possible. If this is not possible, our special care nursery allows mothers to be close to their babies who require strict observation and monitoring, and our inpatient pediatric unit cares for all young people under 16 years of age. Nurses who work in this area are encouraged to become certified in the obstetrics and pediatrics specialty areas. Completion of the American Hospital Association Neo-Natal Resuscitation program is required of nurses working in the special care nursery. HEMODIALYSIS: The hemodialysis unit includes both a nine-chair outpatient area operating on three shifts, six-days per week, and an outpatient hypertension screening clinic for patients requiring monthly, quarterly or annual monitoring by a nephrologist. Our patients include everyone from teenagers to seniors, however, the average patient is 65-years old. Nurses in the Battle Creek Health System hemodialysis unit play a key role in preparing patients for upcoming transplants, since our unit helps sustain patients awaiting transplants at nearby Borgess Medical Center in Kalamazoo, Michigan. We recognize that hemodialysis forces significant life changes in our patients, and we work together with the medical and psycho-social team to make these changes as comfortable as possible. Our dedicated social worker and dietitian complete our care team. Our annual picnics and holiday parties help to create a team atmosphere involving the patients and their families. A three-month orientation program helps prepare nurses for work on this unit. Nurses are encouraged to become certified nephrology nurses. CARDIAC HEALTH: Cardiac health services at Battle Creek Health System focus on the diagnosis and rehabilitation of cardiac disease. Diagnostic testing services include stress tests, EKGs, ECHOs, holter monitors and pacemaker follow-up. Our Cardiac Rehab Program is a sequential, three-phase program of inpatient teaching and monitored exercise, monitored out-patient exercise, and supervised out-patient exercise. Nurses in this area are required to have two years of critical care experience, and appropriate certification is encouraged. In addition to the three-phase program described above, the cardiac rehab team also coordinates a bi-monthly lecture series, sponsors a monthly support group, and conducts blood pressure and cholesterol screenings for the community. The Cardiac Cath Lab opened in 1990 and has treated thousands of patients to date. The Lab is a diagnostic lab, but also performs pacemaker insertion and insertion of interaortic balloon pumps. Patients seen in the cath lab are often referred to the Cardiac Rehab Program for follow-up. In both areas, nurses recognize that the body, mind and spirit connection can work in unison to help a patient get well. Nurses who work in this area must have two years of critical care experience and two years of cath lab experience. Comprehensive oncology services provided at Battle Creek Health System allow area residents to receive much needed care at home, where support systems and family and friends are nearby. Nurses in the Cancer Center at Battle Creek Health System understand the full scope of cancer and its treatment, because they work in our three care areas. These areas include outpatient medical oncology, radiation oncology and inpatient oncology. Our Cancer Center provides an average of 700 patient visits per month, our linear accelerator treats 40-50 patients per day, and more than 20 patients are typically hospitalized in our inpatient oncology unit. Nurses are encouraged to become Oncology Nursing Society (ONS) certified. Approximately 25% of the R.N. staff has achieved this goal. Throughout our treatment areas, oncology nurses work to treat the entire patient. We recognize that many things help patients get well, and encourage patients to take an active role in their treatment. We coordinate several support groups, including a unique “Kids Helping Kids” group of young people dealing with life threatening diseases in their families. The oncology team is extremely current in the therapies administered, we participate in a number of national research protocol studies, and our medical and radiation oncologists view nurses as integral members of the treatment team. Nursing practice at My Canadian Pharmacy is centered around four core values; collaboration, professionalism, a commitment to quality and the importance of human dignity. These fundamental values are more than ideals on paper; they represent our philosophical framework for every patient interaction, every nursing decision, every day. entire care team to achieve excellence. nursing practice continues to be valued and respected. meet the challenges of health care today. be they physical, cognitive, spiritual or emotional needs.